“Aap poora time door khula rakhenga toh AC kharaab hoenga!” scolds a fellow fitness gym member to the lady bathroom attendant. The poor attendant looks like she’s stepped fresh off the boat, straight from the heartland of Hindi-sthan, and this Mumbaiya Hindi is a freakish aberration of language that she is unable to comprehend. She looks frightened, but I wonder if she’s more afraid of the bossy lady or her atrocious Hindi. She nods confusedly, and retreats into the bathroom. As I get onto the treadmill, I think about Mumbai’s relationship with Hindi. Mumbaikars are infamous for their Hindi. The elite cannot speak a decent sentence without peppering it with English words, and everyone else seems to be caricatured by the rest of India as speaking tapori Hindi. Much like the taporis (Mumbai’s outlaws) who popularised it, this type of Hindi is too cool to concern itself with inconvenient language laws of ‘stree-ling’ and ‘pull-ling’ and mixes Marathi and Hindi to create a scandalous language that makes purists cringe. In today’s age, encountering pure languages has become increasingly tough. There may be some Hindi-speaking belts where the language is still found close to its original form, but tongue-twisters like dhumrapan-dandika or lohapathagamini have been abandoned for their easier English equivalents, ‘cigarette’ and ‘train’, respectively. In a global economy where people are constantly travelling, a confluence of influences is inevitable. With the advent of technology, we are facing a time when rules have disintegrated, and no one spells in the same manner anymore. Mobile phones and Internet have brought about their own colourful, shorthand type of texting language. Today’s youth is primarily concerned with getting their point across. Armed with Snapchat, Instagram and their phone cameras, language is no longer necessary for communication. Who has the attention span to communicate through wordy sentences when you could sum it up in a picture? India, in all its advertising glory of ‘Unity in Diversity’, shines out as a country with over 122 major languages and 1,599 other languages, of which Hindi and English are considered the two official languages of the country. The Constitution refrains from calling Hindi the national language because, in this diverse Subcontinent, to give Hindi that kind of prominence would be to ignore the large southern part that lies completely disconnected from Hindi. If language is a powerful carrier of culture and history, then this North-South language divide serves as an indicator of how separate these two halves feel with respect to their cultures. A common misnomer in the North is to refer to all South Indians as Madrasis: a single, undifferentiated mass of people that are nothing like ‘us’. And the South seems to dismiss most northerners as being ‘Hindis’; not a very envious title to have when visiting. With the southern states having their own separate languages, English serves as a unifying factor between these parts, but mostly with the elite, as the common man still doesn’t have fluency. India’s relationship with English has been one fraught with years of contentious history. Being the language of the coloniser, it was first enforced upon us, as something to be celebrated and revered. Our colonial masters knew that to enslave a race, they had to crush the confidence of its people. They broke us down by making us associate shame with our own indigenous ways, leading us to believe that everything that was theirs was better. The Christian missionaries were funded by the British government to establish English-medium schools all over the country, and through these schools, they educated us about their religion, language, technology, history and literary works. We grew up believing that our religions were ritualistic, our languages primitive, our handmade goods impractical, and our attire unmodern. A Kenyan author, Ngugi wa Thiong’o, has spoken of his experience as a student growing up in a colony of the British. He studied in a Christian missionary school and was meted out corporal punishment for speaking in his local language. You were taught to hate your own tongue and your culture. If identity is intertwined around language, when you take away someone’s language, you leave them confused about who they are. I grew up in the 1980s and 1990s. I was enrolled in a convent school since they were regarded as being the best in India. Thiong’o’s words resonated strongly with me because years after the British had left we were still nursing a post-Raj hangover. Although we weren’t hit in school for speaking our mother tongue, the shame was subtly passed on. 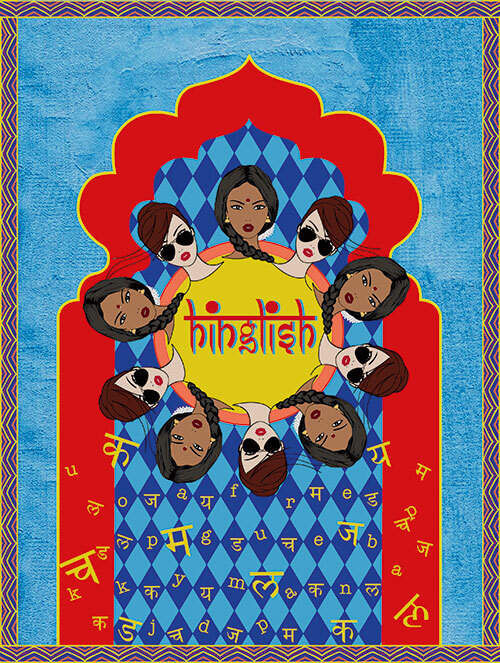 The girls who spoke Hindi or a regional language, even privately, were ostracised as being ‘vernis’ (vernaculars) by the cooler English-speaking crowd. Although India became free, our minds were still shackled by the Anglophilia that the British had instilled in us. All through school, I remember being taught the canons of literature (all British) like Shakespeare and Wordsworth. Although I enjoyed their works, I could never relate to the (mental and physical) landscapes that they described. During Hindi class, we read Premchand’s stories, which didn’t gel with my urban, modern sensibility either. That’s why when Salman Rushdie’s Midnight’s Children was given to us as prescribed reading in college, it was a life-changing experience for me. As I devoured each page, I felt that someone was finally talking about my surroundings in a language that was mine! Rushdie was one of the first writers to break the mould by writing novels in Hinglish: a language colloquially spoken by a large urban, English-speaking population. Till then, we had read novels about India written by British authors in such a ‘propah’ sipping-a-spot-of-tea-in-the-garden-with-my-stiff-upper-lip manner that you couldn’t really find true India in their writings. Rushdie changed all of this by writing in an English that depicted India with all its excesses and paradoxes. He made the story relevant with a ‘chutneyfied’ English; one spiced with Hindi at regular intervals. Till then it had been the Raj writing about us, but Rushdie grabbed that power from the British and radically decided to write in our voice. Some people may believe that we are losing our culture by speaking in such mixed tongues but in a post-modern world, where there are no stringent demarcations (black or white), everything falls somewhere in between. People are comfortable moving away from strict language rules and exploring words. Our urban dictionaries no longer only accept vocabulary put out by the literati as legitimate, but are forced to embrace the unstructured lingo of the youth. After all, in this FOMO generation, you wouldn’t want to be caught MIA because you were too uptight to accept some slang, yo?